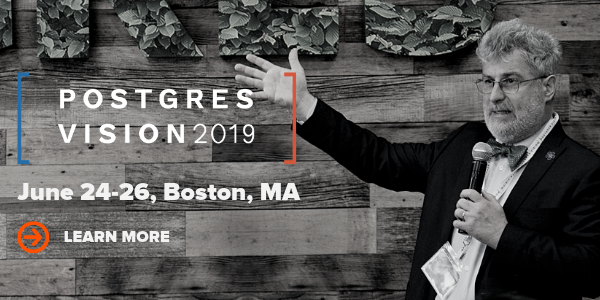 Join us for Postgres Vision June 24-26 in Boston, MA, for a one-of-a-kind opportunity to dive deep into Postgres technology. Check out who has already registered and will be speaking at the event. Register now to get a discounted conference pass. The Call for Papers for Postgres Vision 2019 is open. Share your insights with Postgres enthusiasts from around the globe. Submit your idea for a talk or panel.